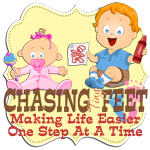 Chasing Tiny Feet: Does Your Child Help With Chores? Does Your Child Help With Chores? My husband and I were JUST talking about this last week. As kids, we both had to complete chores. I had to do fun things like vacuum, dust and clean the bathrooms (YUCK!). I had to complete chores every Saturday morning before I was allowed to go out and play for the day. I had set chores and whether it took me a half an hour or 4 hours to complete them, I couldn't go out until they were done. But, things are different today than when I grew up, and I know some kids today just don't complete chores, for whatever reason. I know chores are not fun and sometimes it seems impossible to get it all done, but we all have to do them. I think of it as an injustice if we do not teach our children to complete some chores around the house. An injustice???? Yes, and here is why. Most experts agree that chores are good for children. In addition to our needs for physical and emotional safety, love and affection, and healthy amounts of control, we also all need to be needed. That's because we're pack animals by nature. Children need to feel as though they're part of something. They can't feel that way if they don't have chores and make contributions to the family. In her book, Raising Compassionate, Courageous Children in a Violent World, Janice Cohn, PhD, cites studies showing that helping others not only promotes higher self-esteem, but increases academic and social skills while decreasing the risk for depression and anxiety disorders. Chores are one of the best ways to build a feeling of competence. Chores help children understand what needs to be done to run a household. Chores establish helpful habits and good attitudes about work. We have Mason do some small chores around the house already. He already puts his toys away, helps to clear the dishes from the dinner table, amongst other things. But what chores should we have Mason complete on a daily basis? What is appropriate for his age? Is he too young for some chores? Should we pay him an allowance? I've been doing research on what the "experts" suggest, and here is what I found. Many parents underestimate what their kids are able to do. Think about this...your child can turn on your IPad, choose an app, buy a game, then play that game, but they can't set the table or start the dishwasher? Huh? Something is wrong with this picture. Generally, young children around preschool age can handle one or two simple one-step or two-step jobs. Older children can manage more. Realize the kids can begin to help with household chores at an early age. Things as simple as putting clothes in or out of the dryer is a chore. Helping to take their plate to the sink or dishwasher after meals is a chore. Don't think children will do this without reminder or making messes either. Try to gently remind your children to do chores, but do have a backup plan if your child fails to follow through. Using the "when/then" technique, such as, "When the pets are fed, then you may have your dinner" will probably work much better than nagging. As with everything when it comes to children, consistency is key. Be consistent in expected tasks and follow through with these expectations or your child will learn to start putting off the chore. One of the biggest mistakes is thinking children should know how to complete a task. Remember, this is how children learn - "the learning is in the doing" and by giving chores, you help to promote this. And, don't expect perfection. If you do, it will only make things harder on you and your child. If you are a perfectionist, give your child a chore that you won't mind if it is not completed perfectly. If you redo your child's chore, you are sending the signal that what your child just did was not good enough...and no one likes to feel that way. Try demonstrating step by step how the chore should be completed. Next, let your child help. And then have your child do the chore as you supervise. Once your child has it mastered, he's ready to go solo. When you do give instructions for your child to complete a chore, be specific. Saying something a simple as 'Clean your room' is vague and can be interpreted many different ways. Instead, be specific in the exact tasks you want completed. For example, say, "Put your clothes in the closet, books on the shelf, dishes in the kitchen, and toys in the toy box.'" Remember to praise your child! And don't wait until the chore is complete. Just like a race that you would cheer your child the whole time, use positive reinforcement as your child is completing the task. This is especially important in younger children. So, the real question is, what are actual chores that are age appropriate for my child? How can you know what to expect of your child and at what age? Start by simply having your child get the silverware to the table. The point is to begin with a chore that is accomplishable and where your child can get an immediate payoff, such as praise. Below is a list of age appropriate chores for children. Bring in mail or newspaper. Use hand-held vacuum to pick up crumbs. Wash plastic dishes at sink. Help make and pack lunch. Cook simple foods, such as toast. Take pet for a walk. Chores for children ages 10 and older. Cook simple meal with supervision. Baby-sit younger siblings (with adult in the home). Make cookies or cake from a mix. So now that we have an idea of the importance of chores and what age appropriate chores are, do you give an allowance for chores? Should your child get an allowance? Most parenting experts say "usually not." That's because the main purpose of an allowance is to teach kids how to handle money. It's especially important to not tie allowance to chores for younger kids. That's because a younger child may be less motivated by money and simply choose to not do them. Once an older child has established a sense of responsibility, however, money can become a nice motivator for certain chores. I agree with this statement. Sometimes it is all about the motivation. Bottom line, kids need to complete chores like they need structure and sleep. Do what works for your family. Start with one chore and go from there. You might be surprised how readily your child accepts completing chores. No allowance!! I'm not paying my kids for what they should be doing anyway!! However, if they've been doing well I will treat them to something nice when we go out. They need to know that they are part of a family unit! TEAMWORK, we do it together!